Depending on where you live, the likelihood of home damage from an outside fire are minimal, though flying embers can still destroy homes from up to a mile away. Protecting your home from outside fire risks is achievable by using ember-resistant building materials. Here are some things you can do to harden your home and make it more fire resistant. The roof is the most vulnerable part of your home. Homes with wood or shingle roofs are at high risk of being destroyed by external fires. Build your roof or re-roof with materials such as composition, metal or tile. Block any spaces between roof decking and covering to prevent embers from catching. Vents on homes create openings for flying embers. Cover all vent openings with 1/8-inch to 1/4-inch metal mesh. Do not use fiberglass or plastic mesh because they can melt and burn. Protect vents in eaves or cornices with baffles to block embers (mesh is not enough). 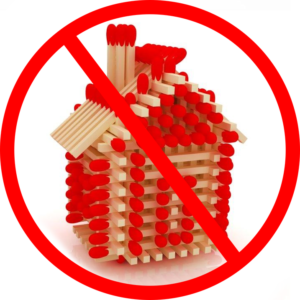 Eaves and soffits should be protected with ignition-resistant* or non-combustible materials. Heat from a fire can cause windows to break even before the home ignites. This allows burning embers to enter and start fires inside. Single-paned and large windows are particularly vulnerable. Install dual-paned windows with one pane of tempered glass to reduce the chance of breakage in a fire. Consider limiting the size and number of windows that face large areas of vegetation. Wood products, such as boards, panels or shingles, are common siding materials. However, they are combustible and not good choices for fire-prone areas. Build or remodel your walls with ignition resistant* building materials, such as stucco, fiber cement, wall siding, fire retardant, treated wood, or other approved materials. Be sure to extend materials from the foundation to the roof. Surfaces within 10 feet of the building should be built with ignition-resistant*, non-combustible, or other approved materials. Ensure that all combustible items are removed from underneath your deck. Screen or enclose rain gutters to prevent accumulation of plant debris. Use the same ignition-resistant* materials for patio coverings as a roof. Cover your chimney and stovepipe outlets with a non-combustible screen. Use metal screen material with openings no smaller than 3/8-inch and no larger than 1/2-inch to prevent embers from escaping and igniting a fire. Have a fire extinguisher and tools such as a shovel, rake, bucket, and hoe available for fire emergencies. Install weather stripping around and under the garage door to prevent embers from blowing in. Store all combustible and flammable liquids away from ignition sources. Consider using ignition-resistant* or non-combustible fence materials to protect your home during a wildfire. Driveways should be built and maintained in accordance with state and local codes to allow fire and emergency vehicles to reach your home. Consider maintaining access roads with a minimum of 10 feet of clearance on either side, allowing for two-way traffic. Ensure that all gates open inward and are wide enough to accommodate emergency equipment. Trim trees and shrubs overhanging the road to allow emergency vehicles to pass. Make sure your address is clearly visible from the road. Consider having multiple garden hoses that are long enough to reach all areas of your home and other structures on your property. If you have a pool or well, consider getting a pump. Protect your home this season with professional services from Peak Roofing Contractors, one of the leading roofing companies in Northern Virginia. We specialize in roof, window, siding, and gutter replacement. To learn more about our services, you can call us at (703) 468-4769 or fill out our contact form to schedule a free estimate.